Well, actually maybe not always. I only learned to love baking cookies in my early twenties(! ), after being enlightened by a roommate about the beauty of whipping up a fresh batch at home. Until that point, I always thought of cookies as this packaged thing you grab at the grocery store. That’s what happens when you grow up in a family where nobody has an interest in baking! ? Since then, cookies have become a ritual, a tradition, and most importantly a baking therapy outlet — one of my favorite things to whip up. Why did I not discover this sooner?! And why, oh, why did my mother not know about the joys of cookie baking?! ? These cookies have been a favorite of mine this autumn — sweet, toasty, cozy, slightly crispy on the outside when fresh. And soft (but not too soft) on the inside. 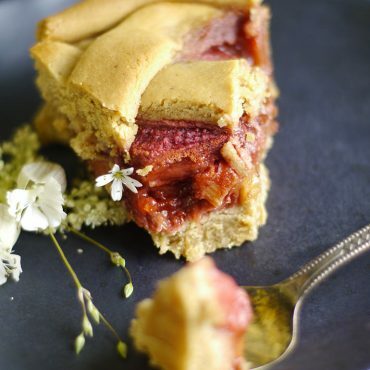 When you want something comforting that will fill the house with an entrancingly delicious aroma… something easy to throw together and easy to demolish with friends… reach for these. P.S. 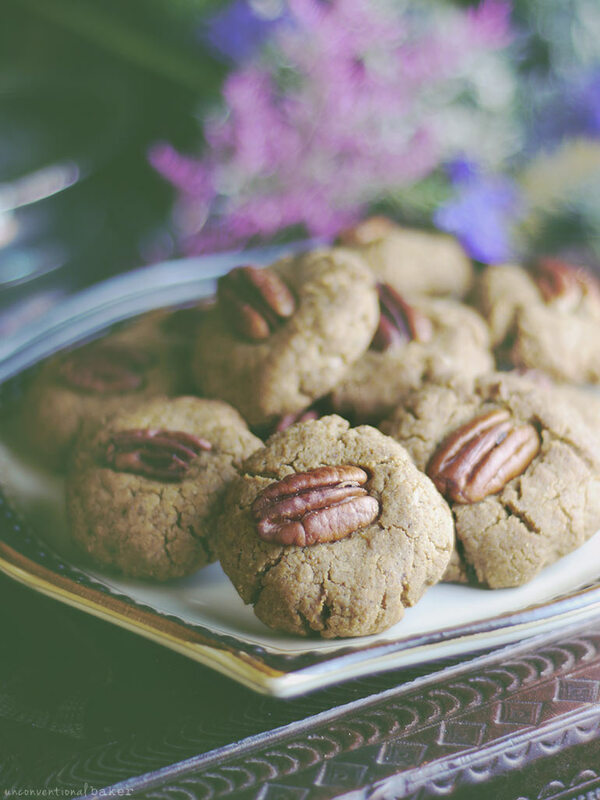 If you love pecans, you might like some of these goodies. 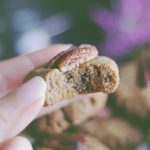 Soft, chewy, warm gluten-free pecan cookies topped with a crisp toasted pecan. Quick and easy vegan dessert. Refined sugar-free. Pre-heat oven to 350F. Line a cookie sheet with parchment paper and set aside. 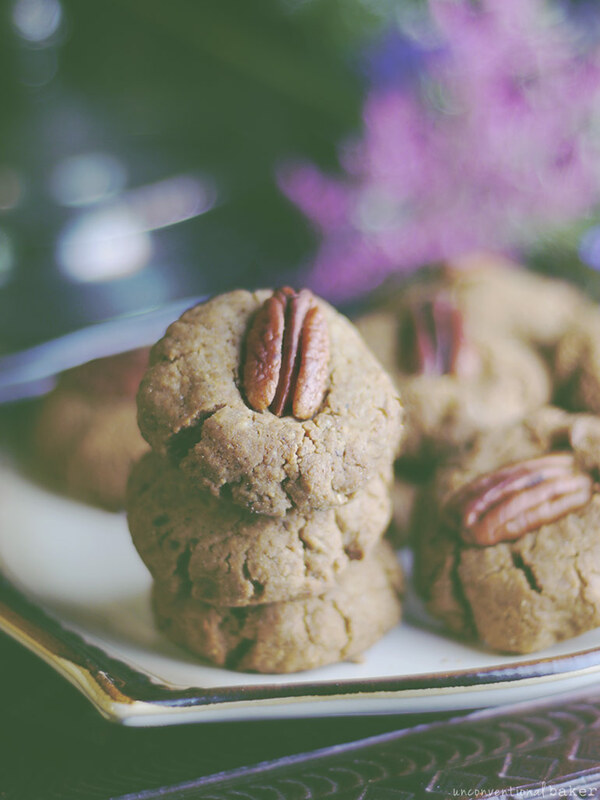 Place all ingredients, except pecan halves, in a food processor and process until the mixture begins to form a ball (note if the mixture is too runny, add a bit more flour, if too dry, add a bit of maple syrup or plant milk). Use a spoon or a cookie scoop to grab about 1 ½ tbsp of the mixture, roll into a ball with your hands and then flatten into a disk. Place on the prepared cookie sheet. Repeat with remaining dough 9 more times until the mixture is used up (to make 10 cookies). 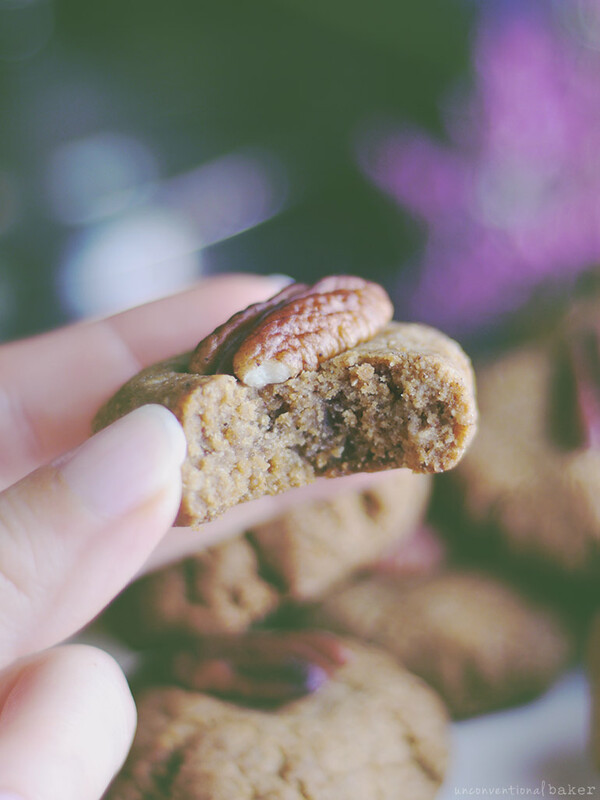 Gently press a pecan half into the top of each cookie. Bake in a pre-heated oven for 20 mins. Remove from oven and cool on a rack. Enjoy! Thanks for all these great recipes, can I try coconut flour or plaintain flour instead of rice flour? Hi Rosemarie. Coconut flour would definitely not work here. You’ll end up with dry, crumbly lumps instead. I haven’t experimented with plantain flour to know how it would act in a recipe like this, so unfortunately can’t comment on how it would behave here. 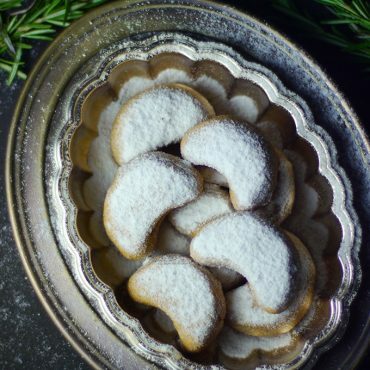 If you’re interested in grain-free recipes, there is a grain-free section on the recipes page, which includes some cookies: https://www.unconventionalbaker.com/all-recipes/ (just select the cookies and the grain-free tabs). Just made, sooo yummy, not overly sweet, love them! That’s awesome — thanks so much for the lovely feedback, Stephanie :) Enjoy them! Hi Adela. Can you do sorghum flour? That would work well. Gluten-free oat flour is another possible alternative. These look, indeed, perfect for Autumn! Love your easy way to make incredible delicious recipes! Thank you, for these cute healthy cookies! I just received your present and have no words to thank you! This brought me a smile today ! I only wish one day I could do the same for you! Thank you so much, Audrey! Oh, I’m so glad it arrived, Natalie! That was faster than I expected based on what the lady at the post office said. Yay. There are some really amazing recipes in there — all so unique :) I got heaps of inspiration for savory stuff. Enjoy it! Very excited to try these, and got a quick question: what brand of white rice flour do you use, please? Bob’s Red Mill is available easily here but it’s not a superfine grind. Also, this is not sweet rice flour, just regular white rice flour – am I correct? Thank you so much for any advice, Audrey! You’re the encyclopaedia of alternative baking, and I am super excited to try some of your recipes for the holiday baking craze this year! ? Thank you so much for your response, Audrey! Yes, I’ve got a Sobeys close to me (Milton, ON) so getting the Compliments brand rice flour should be no prob. I had a similar experience with another store-brand almond flour, which was much finer than Bob’s. Thanks again, I am looking forward to making these cookies asap! Soft, chewy, warm, and pumpkin-y–yep that’s an always kinda craving for me! In my house packaged cookie dough was something you ate as dough pretty much only, and actual cookies were always homemade. Kinda weird now that I think about it, why not make my own dough too lol?? Anyways, packaged cookies really can’t compete with perfect pecan-topped cookies like this. I haven’t ever made a white rice flour cookie, I must try them! Hmmm… and now I kind of want to go make some cookie dough ?? — look what you’ve done!